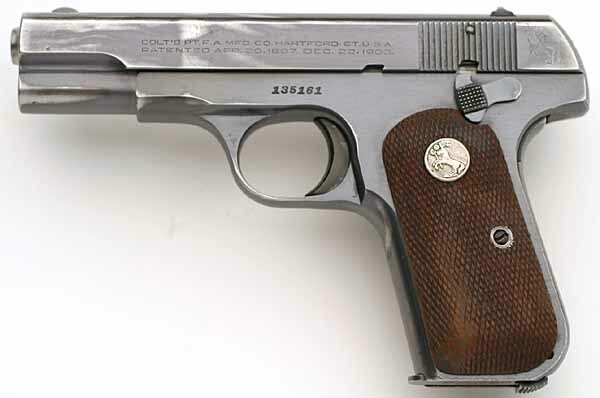 Colt Model M .380 ACP Serial Number 135161 - One of 101 U.S. Property marked Model M pistols shipped directly from Colt's to the General Officer. This pistol was shipped to Lt. General Frank William "Shrimp" Milburn (West Point Class of 1914) on August 24, 1944. 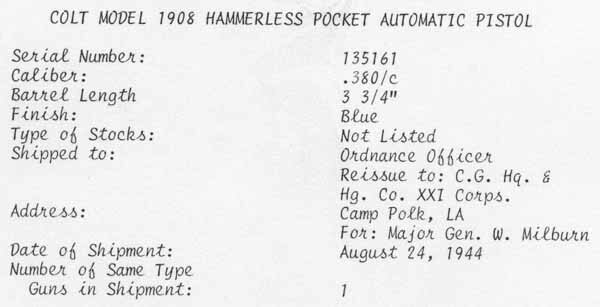 Colt Model 1908 Pocket Hammerless .380 ACP Serial Number 135161 was a single gun shipment on August 24, 1944 to The Ordnance Officer, Reissue to: C.G. Hq. & Hg. Co. XXI Corps. Camp Polk, LA For: Major Gen. W. Milburn. 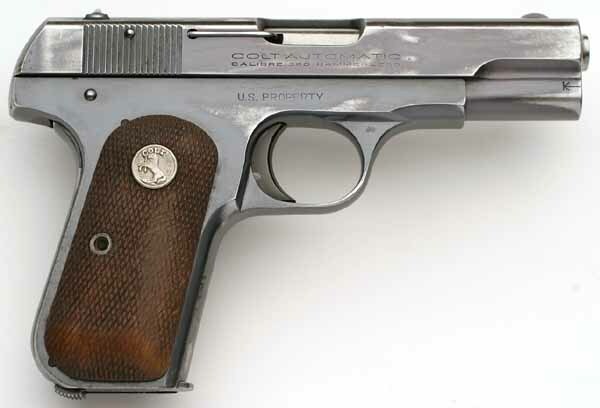 Serial number 135161 is an early U.S. PROPERTY marked Colt Model M .380 - Notice the small "U.S. PROPERTY" marking on the right side of the frame. 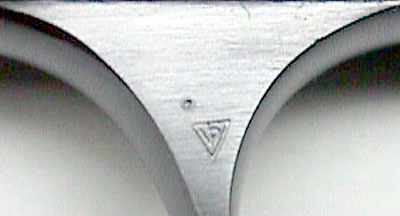 This pistol also has the early sights, early number of slide serrations and punch-dot ordnance mark (see below), located above the Verified Proof mark on the upper left flat of the trigger guard. This was a big moment in the life of the Milburns - Camp Atterbury's Number 1 Family. 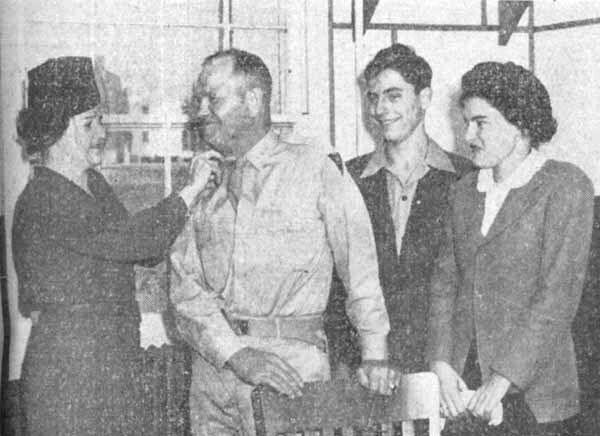 Mrs. Frank W. Milburn pins an extra star on the shoulders of her husband, now Major General Frank Milburn as their two children, Frank and Betty Jane, admire their father's new rank. In the presence of both general and special staff, Mrs. Milburn pinned another star on the broad shoulders of her husband in a brief but impressive ceremony Thursday afternoon and and the commanding general of the 83rd Infantry Division became a Major General. Just as proud of the General's promotion, were his daughter, Betty Jane and his son Frank, who also attended the ceremony held in their father's modest office room in the division headquarters building. The oath was administered by the adjutant general of the 83rd division, Col. E. G. Isaacs. Only other woman present was Mrs. Rinaldo Van Brunt, whose husband, Col. Van Brunt is chief of staff. The promotion followed confirmation by the United States Senate. 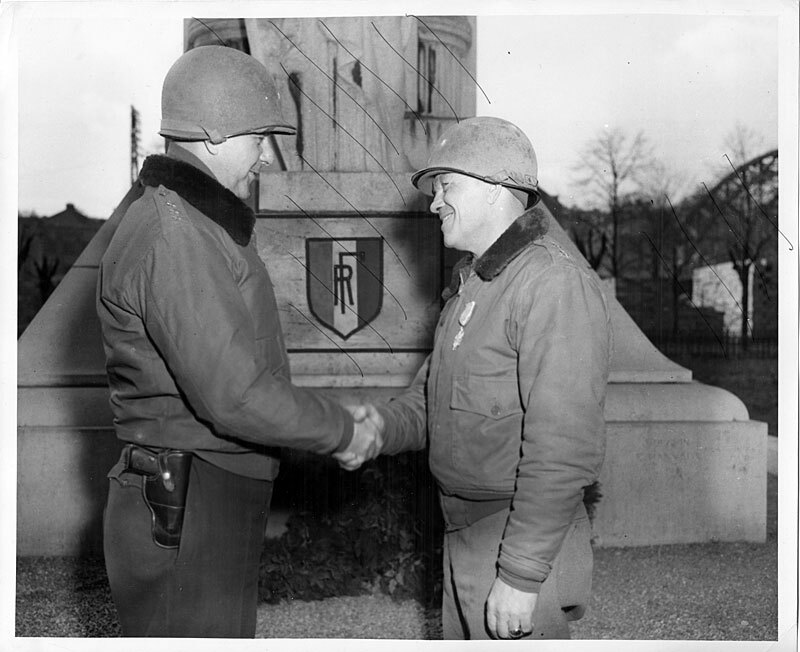 The general had been recommended for the higher rank by President Roosevelt. 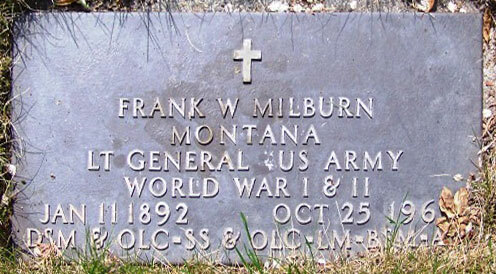 Gen. Milburn, a native of Jasper, assumed command of the 83rd Division in August following the transfer of Maj. Gen. John J. Millikan, first head of the 83rd to Camp Forrest, Tennessee. 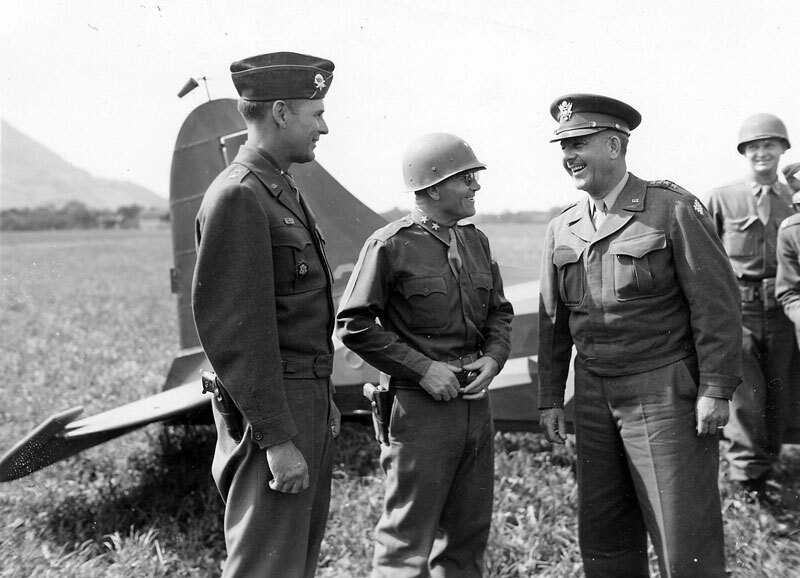 Maj. Gen. Frank W. Milburn, C.G., XXI Corps, Greets Gen. Jacob L. Devers, C.G., VI Army Group Upon His Arrival by plane at cub strip in Degernsdorf, Germany, L-R: Capt. 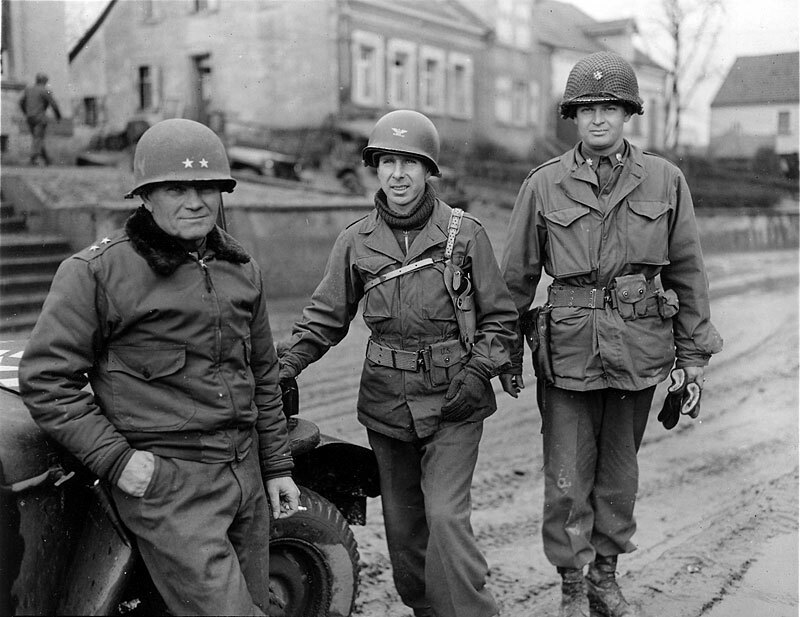 James M. Hayes Jr., Pilot to Gen. Devers; Maj. Gen. Milburn; and Gen Jacob L. Devers. 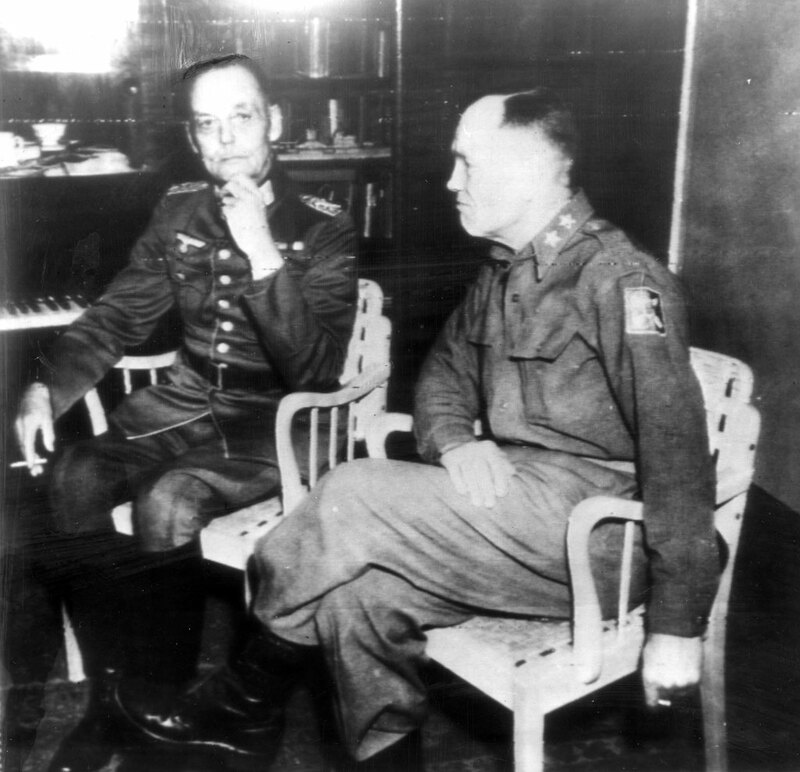 After discussing future plans, Maj. Gen. Frank W. Milburn, C.G. XXI Corps; Col. Charles B. McClelland, O.O. of the 101st Cav. Recon. GP. 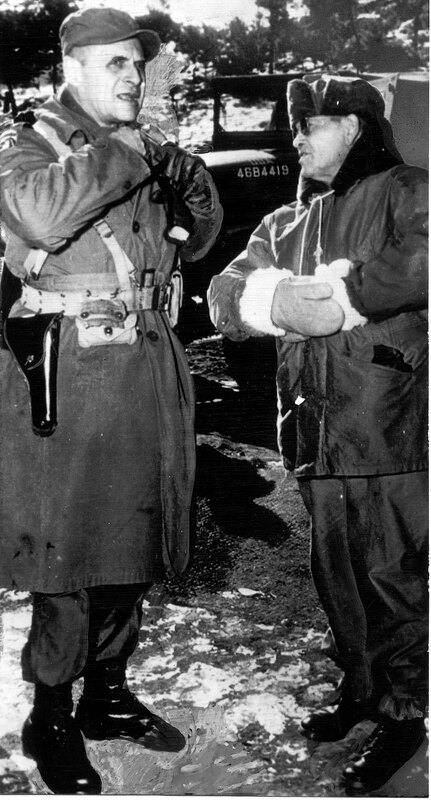 ; and Major E. Griest, the General's Aide-de-Camp leave the 101st Cav. Recon. Group C.P. 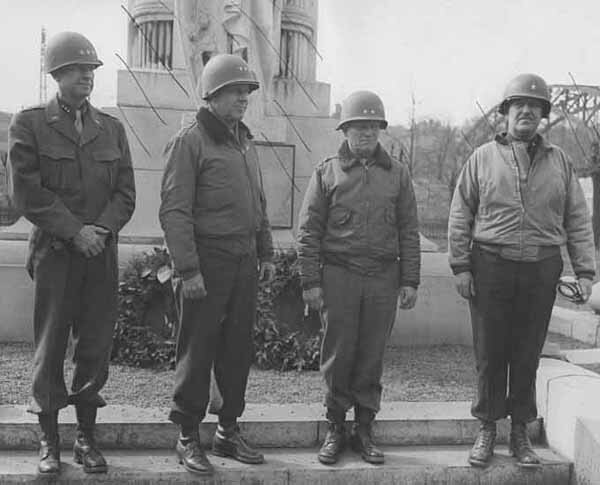 (L-R) LT Gen Alexander M. Patch, Jr., Commanding General, 7th Army; Lt. Gen. Jacob L. Devers, Commanding General, 6th Army Group; Maj. Gen. Frank W. Milburn, commanding General, XXI Corps, Brig. 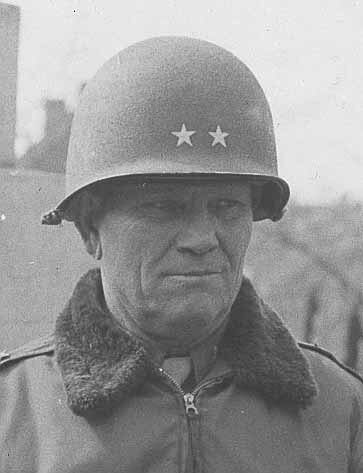 Gen Reuben E. Jenkins, G-3, 6th Army Group. Photo caption - "Exercise Harvest" September 6-17, 1949 - First joint Army, Navy and Air Force maneuver to be held in the European Command since the end of World War II, commenced on 6 September, "Exercise Harvest" is a safe maneuver in which actual opposing forces are U.S. Forces represented by the 1st U.S. Infantry Division, and the "aggressor" composed of units of the U.S. Constabulary, aggressor units are wearing aggressor uniforms. Realism is stressed including firing of blank ammunition, taking of prisoners, air evacuation of wounded and use of visual and sonic deception devices. Tactical air support for both ground forces is being supplied by the 2nd Tactical Air Division, United States Air Force Europe (USAFE). The U.S. Navy is represented by its Rhine River Patrol and at Bremerhaven Port of Embarkation, Director of "Exercise Harvest" is Lt. Gen. Clarence B. Huebner, Commanding General, U.S. Army, Europe. Deputy Directors are Maj. Gen. Frank W. Milburn, Deputy Commander, U.S. Army, Europe for the Army, Admiral John Wilkes, Commander, U.S. Naval Forces, Europe for the Navy, and Lt. Gen John E. Cannon, USAFE Commander for the Air Force. An important element in "Exercise Harvest" is the presence of observers from the U.S. Joint Chiefs of Staff, the Departments of the Army and Air Force in Washington, D.C. and military observers from the European Union countries and other European Nations. 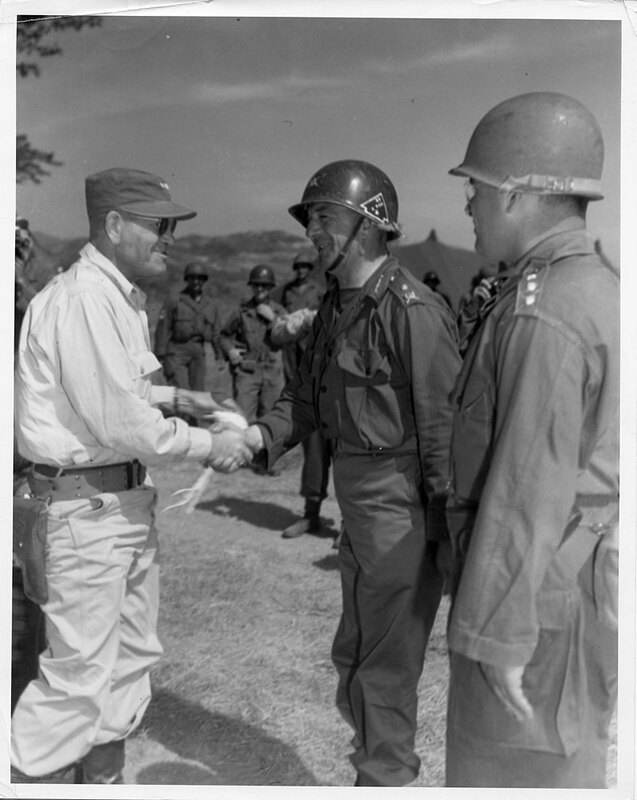 General Tahsin Yazici, CG, Turkish Brigade (center) greets Lt. Gen. Frank W. Milburn, CG, US, I Corps, upon his arrival at Brigade Headquarters, Korea, to attend a Turkish celebration. 6 July 1951. 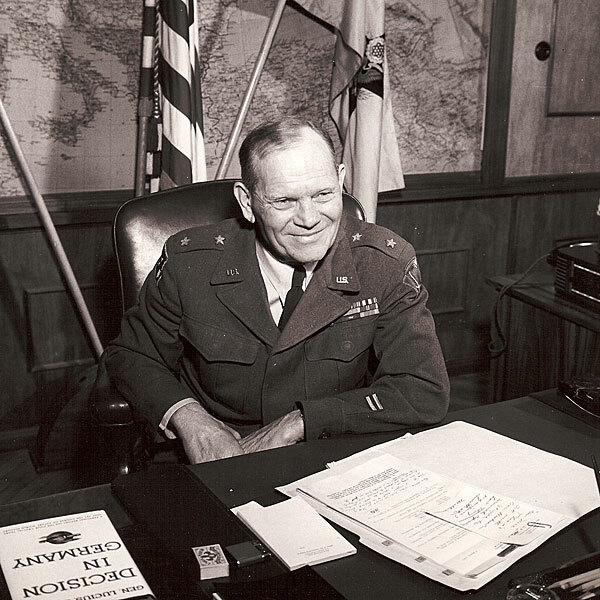 11 January 1892 Born in Jasper, Indiana and admitted to West Point in 1911 from same state. 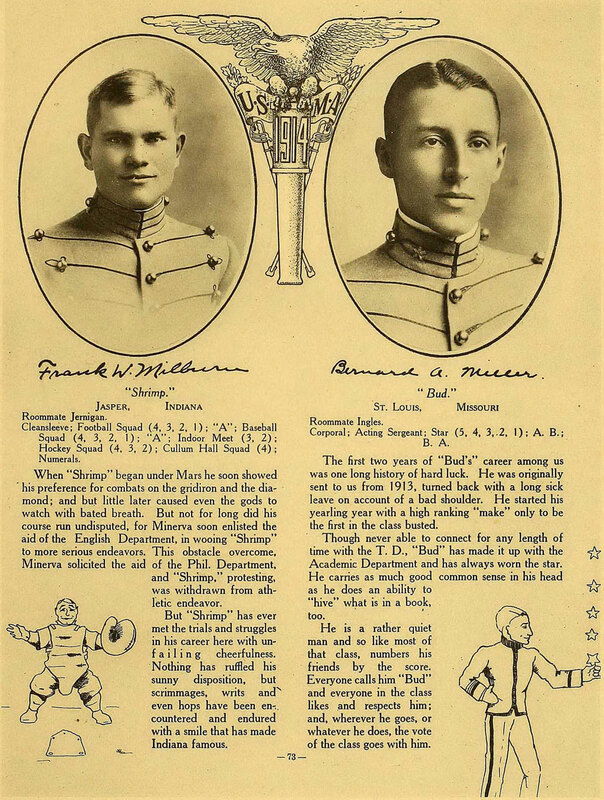 Graduated from West Point, Class of 1914. Commissioned in the Infantry. 1933 Graduated from the Command and General Staff School in 1933, then instructor there from 1934 - 1938. 83rd Infantry Division - "Thunderbolt"
Activated: 15 August 1942. Overseas: 6 April 1944. Campaigns: Normandy, Northern France, Rhineland, Ardennes-Alsace, Central Europe. Days of combat: 244. Distinguished Unit Citations: 7. Awards: Medal of Honor - 1 ; DSC-7 ; DSM-1 ; SS-710; LM-11; SM-25 ; BSM-6,294 ; AM-110. 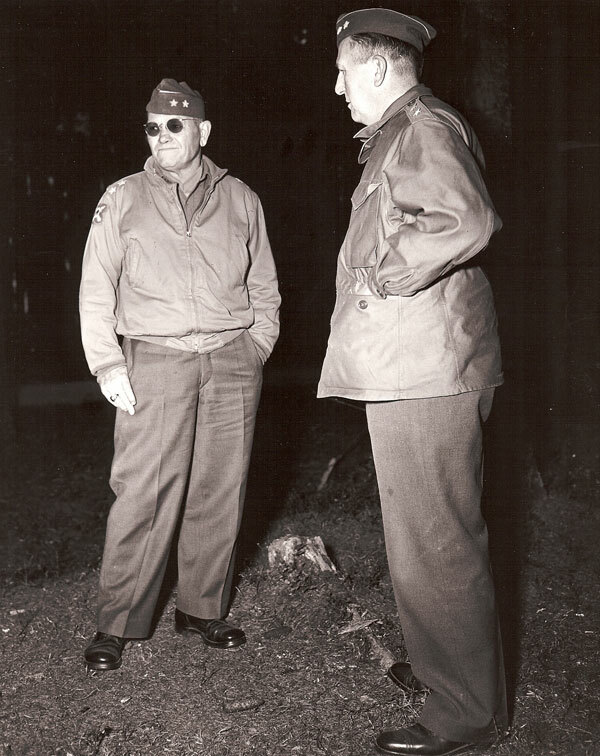 Commanders: Maj. Gen. Frank W. Milburn (August 1942-December 1943), Maj. Gen. Robert C. Macon (January 1944 - 31 January 1946). 26 March 1946 Returned to U. S.
7 Feb 82 Swift, Innis P. 30 Dec 89 Cook, Gilbert R.
28 Dec 83 Fredendall, Lloyd R. 14 Jan 90 Lucas, John P.
11 Nov 85 Patton, George S., Jr. 4 Apr 90 McLain, Raymond S.
17 Feb 86 J. Dawley, Ernest 2 Dec 90 Crittenberger, Willis D.
9 Mar 86 Eichelberger, Robert L. 3 Jan 91 Sibert, Franklin C.
22 Oct 86 Griswold, Oscar 10 Mar 91 Anderson, John B. 12 Dec 86 Hall, Charles P. 11 Jan 92 Milburn, Frank W.
7 Jan 88 Millikin, John 19 Mar 92 Van Fleet, James A. 13 Jul 88 Gerow, Leonard T. 6 May 92 Eddy, Manton S.
8 Aug 88 Gillem, Alvan C. 12 Feb 93 Bradley, Omar N.
24 Nov 88 Huebner, Clarence R. 25 Apr 93 Brooks, Edward H.
9 Jul 89 Haislip, Wade H. 12 Jun 93 Hodge, John R.
31 Jul 89 Corlett, Charles H. 26 Feb 94 Harmon, Ernest N.
12 Oct 89 Middleton, Troy H. 9 Jan 95 Truscott, Lucian K., Jr.
23 Nov 89 Patch, Alexander M. 3 Mar 95 Ridgway, Matthew B. Photo - November 1950. Lt Gen Walton H. Walker, left rear. 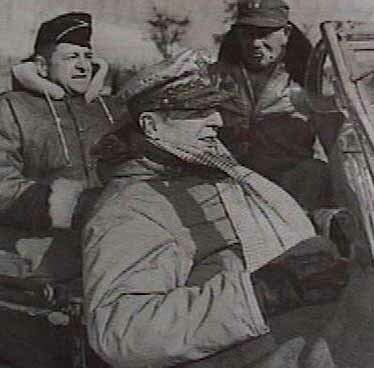 Maj Gen Frank W. Milburn, right rear and Gen Douglas MacArthur, front.